Working together for wellness. The team of providers at Beckman Family Medical focus not only on treating the sick but keeping patients healthy. From annual immunizations and screenings to staying abreast of the latest drug therapies, the emphasis on wellness is apparent. Our goal is to prevent sickness when possible and simple things like getting a flu shot, immunizations and annual physicals are easy ways to avert illness. 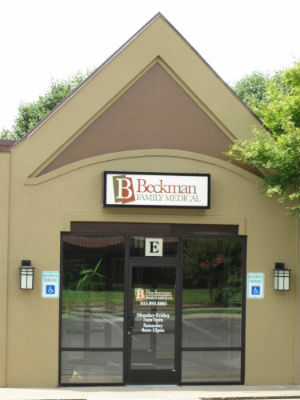 Additionally, Beckman Family Medical offers a full complement of treatments to patients in a traditional appointment based setting. Services range from corporate and executive physicals to caring for patients with chronic illnesses. Procedures like mole and skin tag removal are also offered in the scope of services. We work together to partner with our patients in the long range planning of their family’s total health care needs. Through a strong preventative approach, Beckman Family Medical helps patients attain the healthiest lifestyle possible.